A boatload of tourists in the far eastern Russian Arctic thought they were seeing clumps of ice on the shore, before the jaw-dropping realisation that some 200 polar bears were roaming on the mountain slope. "It was a completely unique situation," said Alexander Gruzdev, director of the Wrangel Island nature reserve where the encounter in September happened. "We were all gobsmacked, to be honest." 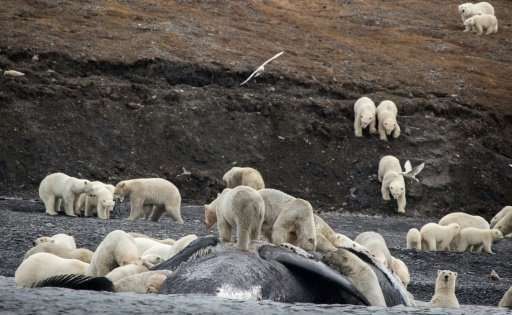 The bears had come to feast on the carcass of a bowhead whale that washed ashore, later resting around the food source. The crowd included many families, including two mothers trailed by a rare four cubs each, Gruzdev told AFP. Climate change means ice, where polar bears are most at home, is melting earlier in the year and so polar bears have to spend longer on land, scientists say. This might wow tourists but means the bears, more crammed together on coasts and islands, will eventually face greater competition for the little food there is on land. Locals are also at risk from hungry animals venturing into villages. Wrangel Island, off the coast of Russia's Chukotka in the northeast, is where polar bears rest after ice melts in early-August until November, when they can leave land to hunt for seals. It is also considered the birthing centre for the species, with the highest density of maternity dens in the entire Arctic, Gruzdev said. "A whale is a real gift for them," he said. "An adult whale is several tens of tonnes" that many bears can feed on for several months. Studies have shown that, compared with 20 years ago, polar bears now spend on average a month longer on Wrangel Island because "ice is melting earlier and the ice-free period is longer," said Eric Regehr, from the University of Washington, the lead American scientist on the US-Russian collaborative study of Wrangel Island polar bears. Changing ice conditions could also be responsible for the increasing number of bears flocking there, Regehr said. This autumn, the number of bears observed was 589, far exceeding previous estimates of 200-300, he said, calling it "anomalously high". The International Union for Conservation of Nature estimates there are about 26,000 polar bears in the Arctic, with a long-term "potential for large reductions" due to ice loss. Ice is key as polar bears hunt exclusively on the ice surface, often staking out seals by their breathing holes. 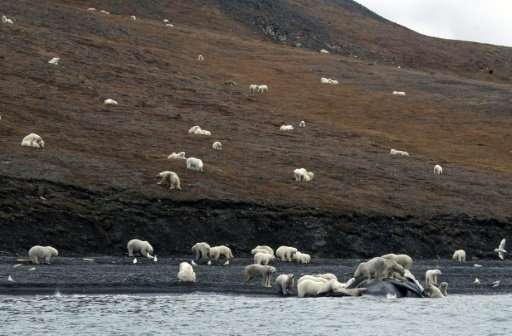 Regehr said the polar bear population in the shared US-Russian Chukchi Sea "appears to be productive and healthy" at the moment, but as time spent on land continues to increase, the bears' nutrition and body condition will be affected. "The question is at what point the population will begin to experience negative effects, is that at one and a half months (more time on land than normal), two months, more?" he asked. "We don't know exactly, but there is a threshold somewhere in the future." Despite some food sources on land—including musk oxen, lemmings, or even grass—nothing can completely replace the energy-packed seals that bears have evolved to rely on. "They are resourceful and adaptable animals, and some bears will probably find something to eat, but the number of bears we currently have in the Arctic definitely cannot be sustained on land," Regehr said. That made the image of hundreds of bears around the whale carcass both impressive and concerning, he said. "There is evidence that it foreshadows the future: larger numbers spending more time on the island and ultimately less time on the sea ice with fewer prey, with a negative cascade of effects." One effect is the increasing chance of conflict between polar bears and humans, for example in native Chukchi settlements, all of which are located on the coast. Since mid-October, polar bears have been coming dangerously close to a Chukotka village called Ryrkaipy, which is located near Kozhevnikov Cape, an important site for walrus gatherings, or haulouts, that lies about 200 kilometres (about 124 miles) south of Wrangel Island. With changing ice conditions, walruses can be forced to come ashore in steep unsuitable areas. This year, hundreds died as the huge animals crushed one another, possibly after being disturbed by a predator, said Viktor Nikiforov, a polar bear specialist and coordinator of Marine Mammals expert centre. The problem is that some walrus corpses then floated to the village, attracting polar bears. "One bear broke the window of a house," Nikiforov said. The village went on high alert, forbade children to walk to school and cancelled some public events, reports said. Nikiforov said scientists and locals used bulldozers to move walrus corpses away from the village. He echoed concerns that bears spend more time ashore as the ice-free period becomes longer. "The concentration of people and animals in one area increases and there is conflict," he said. "We cannot stop climate change, but we can sort out the situation on the shore and make life easier for the bears," he said, referring to measures such as bear patrols to minimise conflict with humans. "With changes in nature, that has to be attended to." That's weird. How does Regehr explain the fact that the current number of bears appears to be sustaining itself just fine? Call it an inconvenient truth. And here's another: polar bears do the majority of their eating in spring when, coincidentally, the seal pups they feast on are born. There is no shortage of sea ice then. It appears that the ice that dwindles in late summer has no measurable impact on polar bear mortality. Incidentally, the minimum sea ice extent in 2017 was well above previous years and the freeze-up began earlier than it has in decades. Oh jeez, just because your link has 'science' in it does not make it so askdad. That is Susan Crockford's blog from the Heartland Institute. They used to work for tobacco company Philip Morris with the aim to deny the health risks of secondhand smoke and to lobby against smoking bans. Now of course they are fully behind climate change denial. How does Regehr explain the fact that the current number of bears appears to be sustaining itself just fine? A read of the article would tell you just that. The bears are adapting - and spending more time on land, and adapting their diet. As ice levels continue to decrease - bears will be forced to spend more time on land - and this will be problematic. You pretty much missed the heart of this article. Also would you provide some data for your claim about 2017 sea ice extent. Here is a couple of graphs that seem to contradict you.